While I am a strong believer in natural beauty, fake eyelashes are so much fun. The first time I wore fake lashes, I was terrified - what if I like stabbed myself in the eye or like glued my eye shut. Real fears right here. Anyways, today I have a guide that will hopefully help your first time using fake lashes be a little less terrifying. Start by finding the right kind of eyelashes. They sell a ton of different kinds at drugstores or Target. 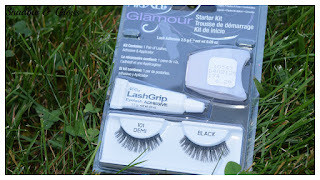 They also have a ton with eyelash glue included which is super helpful! Make sure the eyelashes aren’t too big. Hold them up to your eye and cut down the outer side if they’re too big. Start by squeezing a little bit of glue onto your hand to get it running and make sure it isn’t dried out. Holding the eyelash in your non-dominant hand, squeeze a thin line of glue onto the lashes. Shake the eyelash up and down for a few seconds to allow it to dry a little bit. you want the glue to get tacky so it won’t move when you put the lash on your eye. Close your eye and place the fake lash as close to your natural lash line as possible. Leave your eyes closed and allow the glue to dry naturally. This usually take only a few minutes. Repeat with the other lash. So this is how I apply fake eyelashes. It’s super simple and it’s a very safe way to do it so you don’t injure your eyes. To remove fake eyelashes use a little bit of makeup remover and just slowly rip them off. Trust me, it feels so good to rip them off. Comment below any of your tips on applying fake eyelashes! Or tag us in a picture of you wearing fake eyelashes for a chance to be featured on our insta or twitter!